Rostec’s Technodinamika Holding Company has developed a rescue and emergency raft with a system that automatically opens it and sets it up in working position to save people in the event of an aircraft’s emergency water landing. 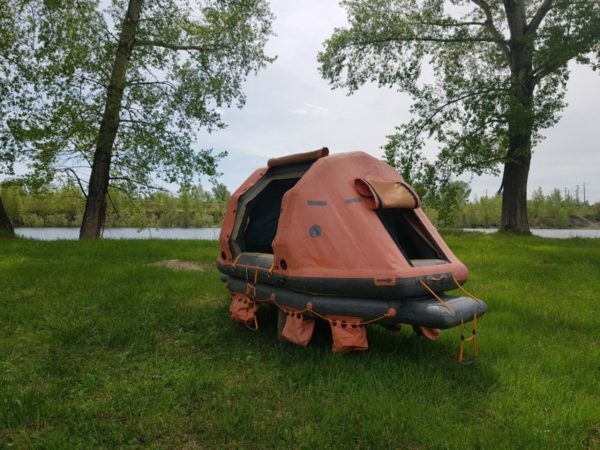 The emergency and rescue raft accommodates up to 17 people afloat for 14 days, protecting them against bad weather and fluctuations in outside air temperature ranging from -30°C to 65°C. The life-saving raft opens in no more than 10 seconds. The special fabric used to create the raft is highly frost resistant and provides a high degree of protection from ozone, ultraviolet rays and contaminant fluids. “During a forced landing on water in the event of an emergency, it is critically important to quickly leave the plane. An automatically unfolding raft is optimal for quick and safe evacuation of passengers and crew. Holding Tekhnodinamika set itself a goal to create a universal rescue and emergency device that meets all international standards and is able to successfully compete with foreign analogues both in terms of functionality and price. At the same time, the use of domestic technologies made it possible to reduce the cost of the product by 2-3 times in comparison with foreign analogues,” said CEO of Technodinamika Igor Nasenkov. In developing the design of the life-saving device, special attention was paid to the mechanisms for opening and setting up the raft, as well as to providing comfort and convenience to people in distress. The rescue equipment has an automatic gas filling system, as well as valves for blowing up the raft with a pump. The raft developed by the Holding Company is the first model in Russia that fully complies with international standards for rescue equipment that is able to automatically take its working position on water. Technodinamika Holding Company specializes in the development, manufacture and after-sale servicing for systems and equipment for civil and military airplanes and helicopters The holding also produces components and accessories for oil and gas industry, automobile production, transport and energy. Technodinamika includes 35 enterprises throughout the country, located in Moscow, Moscow region, Ufa, Samara, Yekaterinburg, Arkhangelsk region and other Russian regions form part of the Company. It is a member of Rostec State Corporation.